This Is The Hourly Wage You Need To Afford A 2-Bedroom Apartment Around The U.S. The National Low Income Housing Coalition released its annual housing report "Out of Reach" earlier this month. 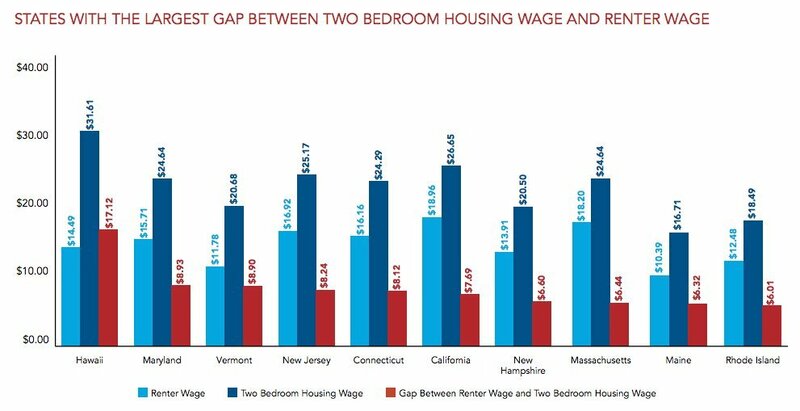 The organization calculated the hourly wage a resident would need to earn to afford a moderate, two-bedroom apartment -- and the outlook is grim. 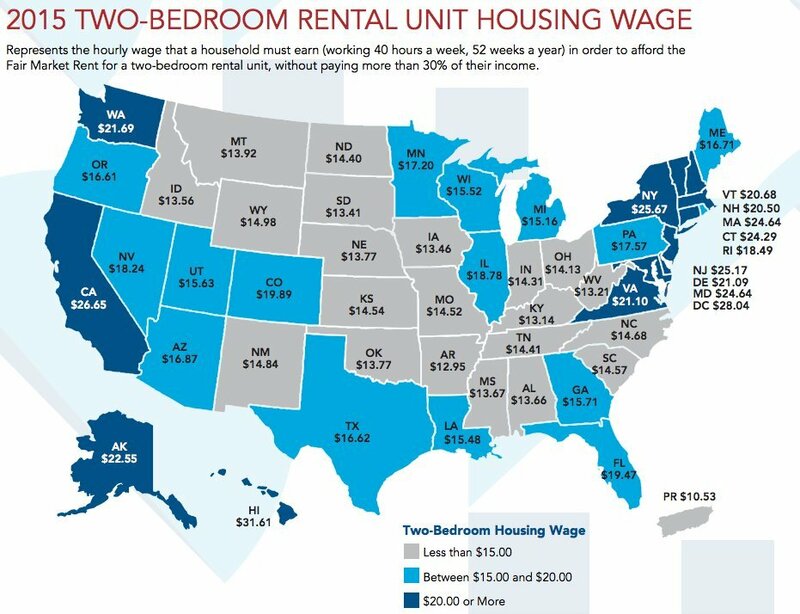 The report found that a person earning minimum wage in each state cannot afford to spend only 30 percent of income on such an apartment in the U.S.
Out of Reach found that the average hourly wage needed to rent a $1,006 two-bedroom unit in the United States is $19.35 -- or $40,240 per year. That's more than two and a half times the federal minimum wage, the report noted, and $4 over the estimated average wage of $15.16 that renters earn nationwide. "The data in Out of Reach is sobering," wrote Oregon Governor Kate Brown (D) in the introduction to the report. "There simply isn’t enough reasonably priced, decently maintained housing to meet the demand, and rapidly rising rents outpace wages. As a result, one out of four households spends more than half their income on housing costs." To see how your state compares to the rest of the country, read the rest of the report at NLIHC.org or scroll through the graphs below. Keep in mind, the charts below show how much hourly employees would have to make in order to avoid spending more than 30 percent of their income on rent, a historically recommended ratio that's increasingly hard to maintain in today's housing market. It also assumes that an employee is being paid for 40 hours per week every week of the year, when many hourly employees are not paid for sick leave, national holidays, or vacation time. This story has been updated with language to clarify the study's research methods. ZipRecruiter score: 0.76Unemployment rate: 3.00Which industries are hiring: Professional services, health care, tech and food manufacturing are all local industries expected to hire in 2015. ZipRecruiter score: 0.75Unemployment rate: 3.20Which industries are hiring: Small and medium-sized businesses in the sectors of education, government, tech and manufacturing will be thekey drivers of employment in Boulder. ZipRecruiter score: 0.69Unemployment rate: 3.20Which industries are hiring: Job seekers in the fields of education, tech and manufacturing will have the best luck finding a job in Fort Collins, Northern Colorado's economic hub, according to ZipRecruiter. ZipRecruiter score: 0.66Unemployment rate: 3.0Which industries are hiring: Home to Warren Buffett, the financial services industry, as well as the health care and tech industries will provide job growth in Omaha, according to ZipRecruiter. ZipRecruiter score: 0.61Unemployment rate: 3.0Which industries are hiring: Home to Brigham Young University, the fields of education, tech and health care are all experiencing healthy growth, according to ZipRecruiter. ZipRecruiter score: 0.49Unemployment rate: 2.8Which industries are hiring: Led by a thriving oil industry, energy services and construction lead job creation in Odessa, according to ZipRecruiter. ZipRecruiter score: 0.39Unemployment rate: 2.7Which industries are hiring: Sioux Falls boasts a diversified and fast-growing economy, providing job growth in the fields of mail-order pharmaceuticals, medical device manufacturing and information assurance, according to ZipRecruiter. ZipRecruiter score: 0.32Unemployment rate: 2.6Which industries are hiring: Rochester, home to the world-renowned Mayo Clinic, is a major center of health care hiring. A new project by the clinic is also expected to bring thousands of construction jobs, according to ZipRecruiter. ZipRecruiter score: 0.11Unemployment rate: 2.2Which industries are hiring: Thanks to booming population growth over the last decade, education and health care are the main drivers of job growth in Fargo. ZipRecruiter score: 0.07Unemployment rate: 2.1Which industries are hiring:Lincoln is first in the nation in job growth for construction, financial services, state government, manufacturing and health care, according to a study by the University of Nebraska.